Privacy Cubicle Track is a ceiling mounted track that is typically used to hang privacy cubicle curtains, divider curtains, shower curtains or other curtains that have grommets across the top. There are several reasons why this type of track is the industry standard, being the hardware of choice in hospitals, clinics, medical offices, spas, gyms, locker rooms, dance studios, and retail outlets across the US. 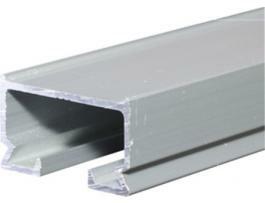 Durability: This track is an aluminum track that is made to hold up to both use and abuse. It is slight wider than standard curtain tracks and can readily support virtually any fabric curtain. Since it is often used in commercial settings, the users of the track don't often take the care a homeowner may in drawing the curtains. 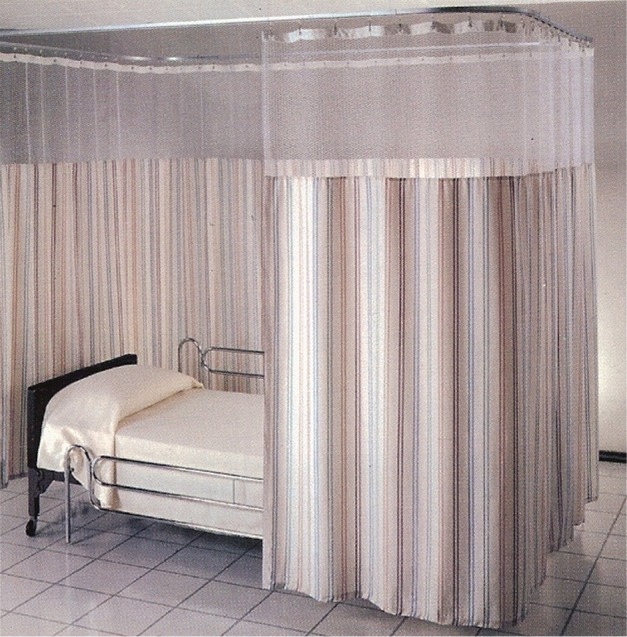 In medical settings, privacy cubicle curtains are often thrown open or closed in emergency situations. The wheeled carriers that are compatible with privacy cubicle track move smoothly and easily in the track, making it easy to move the privacy curtains opened and closed. Configuration: The track sections are available in straight sections and pre-bent 90 degree and 45 degree corner sections. These three track components can be combined to form most desired layouts ranging from straight track runs to L, U, squares, rectangles, and neo angles. Because a splicer is available, it is simple to properly install the tracks in sequence without inhibiting the easy movement of the carriers across the seams. It should be noted that the 90 degree and 45 degree bends are formed on a 12 in radius, so square corners are not an option. This is the case with all curtain tracks. Appearance: This track comes in a silver satin finish that blends nicely with most decors. The hardware offers a sleek appearance. The different carrier styles all blend nicely with the tracks and privacy curtains. Privacy cubicle track can also be recessed into the ceiling if preferred as well, to help conceal its presence. However, this is not necessary as the overall look of the track mounted to the ceiling makes it quite subtle. Value: While Privacy Cubicle Track performs well and looks great, it also offers great value as well. A 16 ft straight run of this track (2 x 8 ft sections) with 42 carriers, 2 end stops, and a splicer totals only $120.41. This is certainly affordable for most applications. This Privacy Cubicle Track is the industry standard and certain offers excellent value. As a customer looks to install a ceiling mounted track for a privacy curtain (privacy cubicle curtain), the 88001 Privacy Cubicle Track offered by Curtain-Tracks.com is a terrific option. This is the go-to track for most commercial application, and also makes a great choice for homeowners and apartment and condominium renters as well. It is also a great choice for retail stores who want to put up a curtain walled dressing room, or a college sorority house that needs to add privacy. There is really no limit to the uses of this track. If you have any questions about how to correctly configure a Privacy Cubicle Track order, the staff at Curtain-Tracks.com is always here to help. Don't forget that we can also supply Privacy Cubicle Curtains in a wide range of fabrics and colors as well.